In 1808, the reconstruction of Fort Norfolk became part of the United States coastal defense strategy. Secretary of War Dearborn dispatched Captain Walker Keith Armistead of the U.S. Anny Corps of Engineers "to take up post at Norfolk" and to direct the military construction at "all the ports in Virginia and Maryland." Captain George Bomford and Lieutenant E. D. Wood were also ordered to Norfolk to serve as Armistead's assistants (BC #144, Distribution of the U.S. Army Corps of Engineers, April 1808). Armistead had graduated first in the West Point class of 1803 and was beginning a distinguished career in the U.S. Army Corps of Engineers. The young captain's work on Forts Nelson and Norfolk in 1808-1809 almost certainly led to his promotion to major in 1810. Two years later, he made lieutenant colonel and directed Norfolk's defenses during the War of 1812. In 1818, he was appointed Chief of Engineers (Clary 1990:33). On June 16, 1808, Captain Armistead sent a report to Secretary Dearborn. "I have been here some days," he explained, "and I am preparing to commence the works at Fort Norfolk." Armistead added that he hoped "to have the workmen on the ground" by June 20. However, after making his own reconnaissance of the Norfolk harbor defenses, Armistead had reached the conclusion that Fort Nelson "was very deficient as to the defense of the channel." Armistead and his assistant, Lieutenant Wood, had taken a small boat to view Fort Nelson from the vantage point of the "ship channel" in the Elizabeth River. While rowing over to Fort Norfolk, Armistead observed that "there was not less than two situations quite undefended and where a Ship of War might have layed and not more than one gun from [Fort Nelson] brought to bear on her." Armistead felt that the problem was "owing in great measure to the guns not being mounted on Barbette" (BC #170, Armistead to Dearborn, June 16, 1808). Situating the guns "en barbette" meant placing them on platforms where they could fire over Fort Nelson's ramparts rather than through embrasures (Robinson 1977:198). Captain Armistead began to envision Fort Norfolk as a more developed position capable of compensating for Fort Nelson's flaws. He recommended alterations on Fort Nelson and then pointedly asked the Secretary of War's permission "to make the contemplated work at Ft. Norfolk more extensive." Armistead also inquired whether barracks were to be built "on the Fort Norfolk side." The War Department responded by ordering Armistead to lay out a "semi-circular battery in front of the temporary works at Fort Norfolk for 10 cannon." Eight days later, Armistead reported that "the battery contemplated in your letter has been planed and the materials are now collecting." Armistead had hired a contractor to furnish and lay the brick at "$10 per thousand." On August 1, the bricklayers had begun the work, and the engineer had received "assurances that the work shall be finished by the last of October" (BC #170, Armistead to Dearborn, June 16, 1808; BC #171, War Dept. to Armistead, June 25, 1808; BC #173 and #176, Armistead to War Dept., July 3 and August 1, 1808). The semicircular battery at Fort Norfolk reflects the "design principles" of Colonel Jonathan Williams, the first chief engineer and superintendent of the United States Military Academy (Clary 1990:27, 32). Once Armistead had procured the materials and signed the contractor agreements, he placed Lieutenant E. D. Wood in charge of supervising the actual construction at Fort Norfolk. (Armistead had been ordered to begin the survey of Fort Powhatan at Hood's Point on the James River.) On November 8, 1808, Wood informed the Secretary of War "that the Water Battery at Ft. Norfolk is completed and when the platforms are prepared it will be capable of receiving 20 pieces of cannon." Wood added that "we have made some alterations in the Old works adjacent to [the water battery] and we are now repairing them." He planned to have the works completed by December 1 (BC #186, Wood to Dearborn, November 8, 1808). A comparison of Sexton's 1795 plat and Poussin's 1819 drawings of Fort Nelson indicate that Armistead radically altered the configuration of the earthwork. It appears that little of the 1795 earthwork was incorporated into the 1808-1809 fort. The Poussin drawing will be discussed below. In May 1809, Armistead sent the War Department an "estimate" on the work at Fort Norfolk. According to Lieutenant E. D. Wood, the curved outer wall and adjacent works had been completed in late 1808. It appears that the buildings and other features on the fort property were constructed during the winter and spring of 1808-1809. Armistead listed the total cost as $24,531. Half the amount derived from the "1.2 million bricks laid in the wall at $10 per thousand." The cost of the "Officers Quarters & Magazine & c." was placed at $5,000. He spent $3,360 for "23 gun carriages made in Garrison not including casting wheels." Wages paid to laborers (which presumably included the artisans who fashioned the gun carriages) totaled $1,300. Expenses for "platforms, timber, plank, and workmanship" were $801. To stock the fort with supplies, a $500 wharf and crane were added. Finally, the flag staff was priced at $130 (BC #206, Estimate on Fort Norfolk, May 22, 1809). 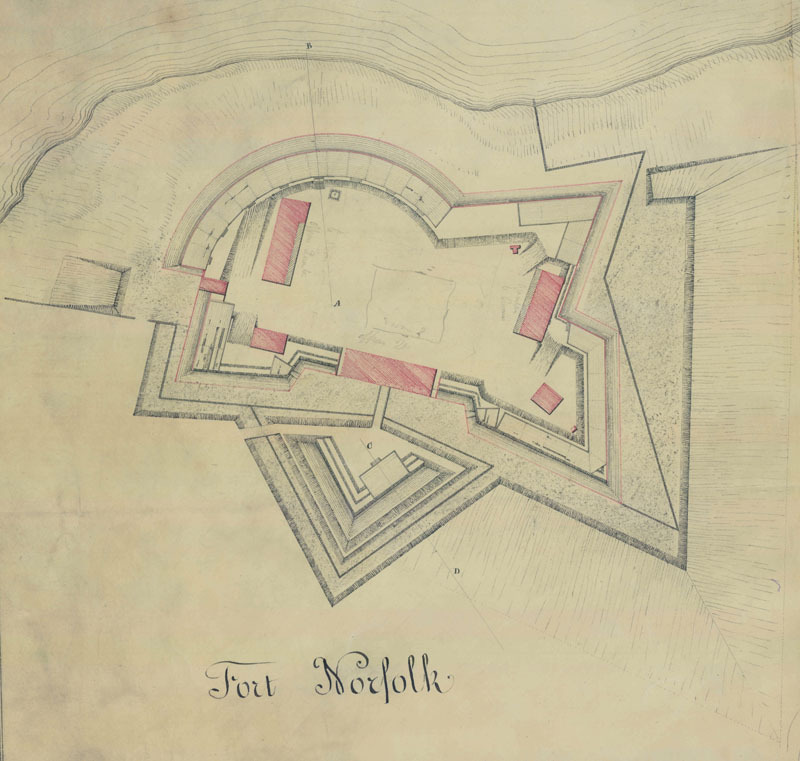 In 1809, Secretary Henry Dearborn described Fort Norfolk as "an enclosed work of masonry, calculated for thirty guns, ten mounted; with a brick magazine, and barracks for two companies, including officers" (Clary 1990:32). No plans of the fort that were made during the actual 1808-1809 period of construction have been found. After the 1795 Sexton plat, the earliest renderings of Fort Norfolk located during the research for this project were an 1816 plat of the fort property (which does not include a plan of the fort) and the more familiar 1819 Poussin plan (see above). Both of these documents depict the site as it appeared after the War of 1812 and will be discussed in due chronological order.